There’s nothing more annoying while driving than having a sagging headliner touching your head. It’s annoying in the kind of way an out of balance ceiling fan is annoying. There’s no real danger, it’s just annoying as heck. Plus, with a sagging headliner, it really let’s down your cars interior. It’s time to get that fixed. This post outlines the many ways of getting that done. Some ways are easy, some are hard. But each way mentioned can work. Pick the method that works for your situation and your skill level. Headliners are mostly just a layer of foam and a layer of pretty material which you actually see. Heat usually causes a droopy headliner. That’s why it’s wise to crack a window when your car has to sit out in the sun. Window tint also helps. What happens is your cars interior gets so hot the adhesive changes its chemical makeup in a way that ruins its ability to hold up the material. Thus, you get sagging. It’s your job to get the material to hang back up their against the foam. Perhaps you work in a lab. You’re comfortable with needs and you’re allowed to take some home with you. Fill a syringe with glue and poke it through the headliner material. Be careful not to go into the foam. Squirt the glue in as atomized a pattern as possible. Pretend you’re a wiper spray nozzle for your windshield. You want as wide of a spray pattern as possible. If you just blob out a bunch of glue at once, it will leak through your thin material and leave and unsightly splotchy mark. Use a roller to even out the flue and make sure the headliner stays flat when you finish. I really only recommend you give this a try if there’s just a fairly small spot that needs repaired. Doing an entire headliner would be quite tedious. This is a sneaky way of doing it. Your headliner probably wraps around hardware in a few places: perhaps a sunroof, grab handle, overhead lights, sun visors, rubber door/window trim, etc. Pop off any of that hard ware to reveal the rough edges of the material. This is your access point. From there, either use a syringe, long flat blade (could use a ruler), or a can of cloth adhesive spray glue. Spray it between the material and foam. Use a roller. This is the best way getting a factory fresh look. You need to take the entire headliner out of the car. As you may suspect, this job can be pretty tricky, especially if you have a car with a trunk. 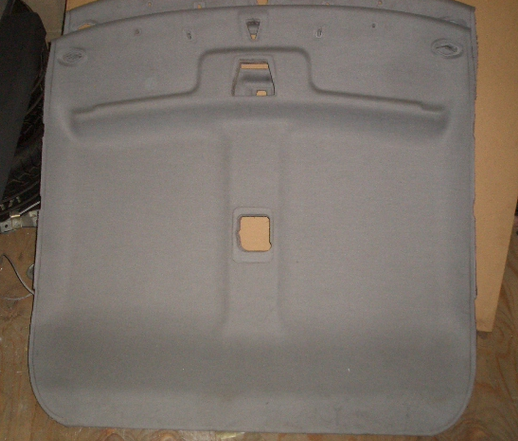 Cars with hatches, lift gates, or tail gates make it easy to drop pull out the headliner through the back of the car. Cars with separate trunks mean you have to play a little Tetris. Although this way of fixing a headliner is awkward, it can be done by basically anyone with a screwdriver. If you’re a perfectionist who wants the fix to last a long time, this method is best. and a roller to get the glue flowing again. Simple heat, roll, and admire your work. and go to town. You’ll staple the headliner material back into the foam. Buy a lot of staples because a really saggy headliner takes staples about every 5 square inches. Two minutes later, you can sit back and admire your work. If you squint really hard and night, it looks like there are shiny stars on your ceiling. This is sure to impress your date. There you have it. The 5 most effective ways for fixing your headliner. We covered everything from a factory fresh fix to a budget fix for those who aren’t keen on appearance. Whatever method you pick, you are sure to get the job done. Leave a comment if there are any other car fixes you would like to know about. Upholstery (slip cover) pins are prettier than staples. You’ll need to pierce small holes in the card layer above the foam to get them through. I used a dental pick, but any small rigid sharp object would work.